"The 1960 Nixon versus Kennedy battle was the first great TV election ever fought," says Matt Smith, co-founder of The Viral Factory. "It allowed the American public to see JFK and they liked what they saw. "In the same way, 2008 was the first great internet election. Barack Obama didn't personally use Twitter in the way JFK used TV, but he was smart enough to let his campaign harness its power. The question is - is this year's UK election the first time Britain's political parties will get to grips with new media themselves?" Certainly, the immediate signs suggest it will be - albeit on a significantly smaller scale. US campaigning literally takes years while, assuming a 6 May election, the British system is just getting started. All the same, there is evidence Westminster is increasingly aware of the web. The Tory party took the lead immediately after the 2005 election, hiring Rishi Saha to oversee online activities such as setting up Myconservatives.com and WebCameron, David Cameron's video diary, which is one of the most popular sites in the politics section of YouTube. Assisted by right-leaning bloggers such as Guido Fawkes, the Conservatives dominated cyberspace until recently - to such an extent that the April issue of Wired hailed the Party as online pioneers. In part, this activity was a reaction to the Party's experience on the ground, according to Jeremy Hunt, Conservative MP and shadow culture secretary. He told Media Week: "I've been finding that the people who come to my surgeries are usually far more knowledgeable than I am about the issue they have come to discuss, because the internet allows them to be specialists. "Spouting the Party line doesn't work. Citizens expect to participate in debates and decision-making. It's like the best companies - they don't just ask their customers what they think, but allow them to design and customise products." Since 2009, however, the Labour Party has been catching up. Head of new media Sue Macmillan has built up an extensive email database, and the Party has launched an iPhone app that co-ordinates campaigning, as well as a series of issue-based websites such as BackTheBan, Ed's Pledge and Save Our Sure Start. However, its best result came from outside the Party, after sympathetic bloggers mashed up Tory branding posters featuring David Cameron into a series of satirical barbs on mydavidcameron.com. With only £9m to spend on the General Election compared to the Tories' £18m, the Labour Party is grateful for this support. 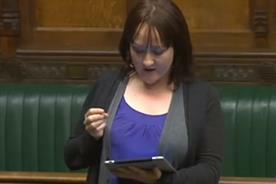 Kerry McCarthy, Labour's new-media organiser, nicknamed the "Twitter Tsar", explains: "We have been fostering the online community of members and supporters, who are involved in anything from Tweeting activists to creating viral campaigns off their own backs - like the shadow web cabinet that spoofed the Tory cabinet." She adds: "It's this community that beta tests much of what we do. If we'd shown them something like the Conservative's Cash Gordon site, they would have pulled it apart in hours - showing us that it wasn't very good and that it could easily be used by the opposition. "They have also lobbied for films at conferences to be used as party political broadcasts and they have been the people spoofing those airbrushed David Cameron posters. 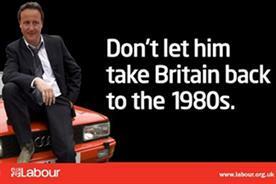 We then took one of those spoofs and put it on Labour's main website, with a link and a credit of course. It's crowd-sourcing from the bottom up." However, some ad agencies working for the three main parties are worried about the potential problems of the online world. One senior executive at an election agency complained that activists ranting on Twitter have caused more harm than good. "It just takes one renegade MP to say something off-message and you've got political journalists ruining a campaign strategy it's taken you weeks to create," the source grumbled. "Show me a story generated by the web that isn't negative - and they're being created 24/7 rather than just on the News at Ten." For activist Peter Tatchell - who has stood for the Green party but whose poor health makes that impossible for this election - this freedom to rock the boat is the point. He uses his website, an online TV presence and daily emails to campaign on issues from the environment to homophobic laws in Uganda. Tatchell believes the internet could allow collaboration between parties outside the mainstream and upset commentators' expectations. "In Britain, the combined supporters of liberal, green and left values constitute the majority," he argues. "If people from these three political strands co-operated more closely, and if we had had a fair voting system, we could move the country forward on a progressive agenda. "One of the things I have learned from my 43 years of human rights campaigning is that no matter how small and weak we may feel, we can all help make a difference." However, some industry figureheads argue that it's a mistake to assume the American lesson can be applied over here. Chris Harris, managing director of ad agency Leagas Delaney, explains: "Social media worked particularly well for Barack Obama because it captured a moment and spirit - something you can't control." "The spoof versions of David Cameron's posters are a far more obviously British take on social media - it allows us to ridicule pomposity. In terms of taking debates on, it seems to me that online conversations tend to push people into extreme positions - you get people who are motivated by a subject but haven't necessarily thought things through." He adds: "I worked at Saatchi's during the famous ‘pregnant man' poster days and I think posters are still going to play a massive role in this election because they are still the simplest way to refine and reinforce your message." But The Viral Factory's Matt Smith believes the main parties still haven't got it. "I was listening to John Prescott on Radio 4 talking about using the social web - or some other phrase he seemed to have made up - as if it was another TV channel," he sighs. "There are some very clever people in all the parties who how know how to use social media as a proper two-way brand communication. The problem is, the people at the top just don't have a clue." 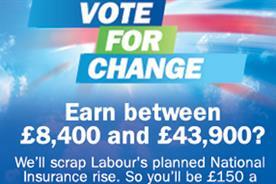 Gordon MacMillan - Our ad agency isn't working, but will negative campaigning? Mark Hanson - It's the audience, stupid!